Happy Saint Patrick's Day!!! 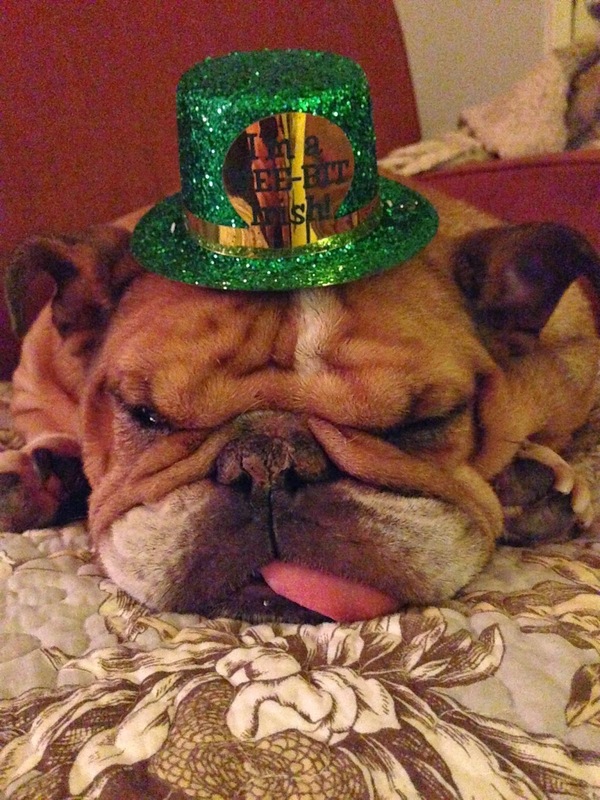 Blanche hasn't tied one on...she is pretending to be asleep because she doesn't want to wear the hat! Hope everyone has a Fabulous Day!! Finally a couple of sunny days, maybe 3, in a row! I did manage to get a few seed trays started and pull a few weeds out of the beds and take the pig off of the roof. Fairly productive weekend. Only one more coat of paint to go on bedroom and then the bathroom….if I hate to paint so much why do I force myself to do it? A color obsession never dies. We watched the final episode of Breaking Bad last night, big sigh. The show was truly fabulous. We are extremely glad we watched it all at one time, it would have killed me to wait week to week for that one. It is one that will be extremely hard to top. I am hoping the new flavor, Blanche's Banana Bites go well, still in planning stages. They will be wheat free with you guessed it….bananas. Now to decide what would be best, milk or egg?? ?